Narrator: But does the container really affect the flavor? Soda companies claim to use the same proportion of ingredients. A company spokesperson for Coca-Cola told us that Coca-Cola uses the same recipe regardless of the package type, and that it’s best enjoyed ice cold. But there are a few factors that could still affect the way you taste it. Cans are typically aluminum, lined on the inside with a polymer that can contain BPA or Bishphenol A.
Rick Sachleben: The amount of that material that would get into the contents of a container are so low I don’t think it would have any effect on the flavor. Narrator: This lining protects the taste of the soda and keeps it from being contaminated by the metal. Sachleben: The likelihood of having a break in that lacquer coating, that plastic coating, and exposing the contents to the metal are pretty, pretty low. Sometimes cans can taste a little bit metallic. Narrator: So where is this sensation coming from? Narrator: So while unlikely, it’s possible that even the slightest bit of contamination might affect the taste for some. Now let’s take a look at carbonation. Humans taste carbonation using the same taste receptors that recognize sour foods according to a 2009 study by Science Magazine, and we can also detect carbonation from soda in another way. Sachleben: When you drink it you get two things going on: one is you get that tingly thing from the bubbles, but you also get that carbon dioxide going up in your nose; it carries the other flavors into your nose as well. Spackman: So carbonation can slowly, potentially, leak out of a plastic bottle in a way it can’t leak out of a glass bottle. That’s assuming they’ve both been appropriately filled. Sachleben: The structure of the glass is pretty tight, okay? It’s like a really tight mesh rather than a loose mesh. The diffusion rates through glass are really, really slow. And in metal it’s the same thing. Narrator: Light can cause chemical reactions to occur, and some of the substances in there may change some of the flavor compounds. Sachleben: A lot of the flavor compounds are really subtle molecules; they’re the sort of things that can really a little change can change their flavor a lot. Spackman: So something that’s bottled in glass and stored away from light is going to have a flavor profile that can last much longer, and also carbonation levels that will stay consistent much longer, than something in plastic. 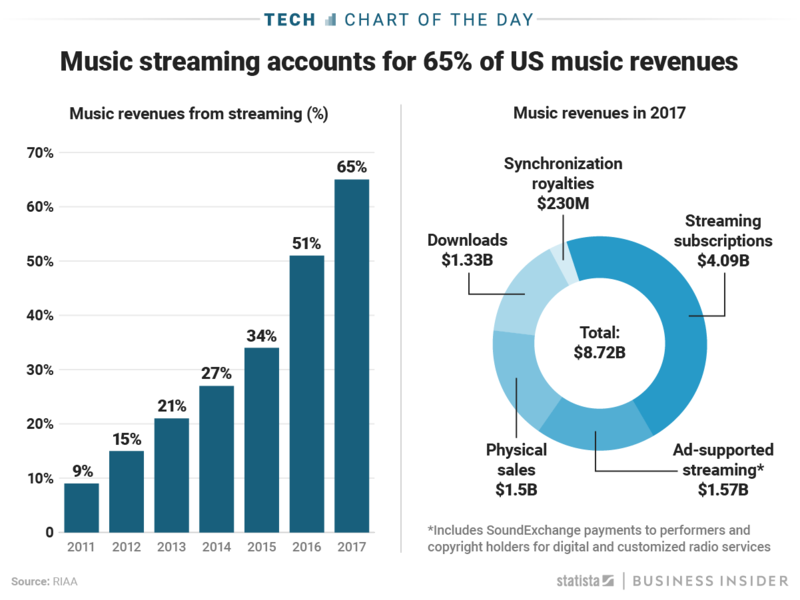 As this chart by Statista shows, the leading source of revenue within the music industry are streaming services like Spotify, Apple and Amazon. The streaming music business generated more than $4 billion in revenue last year, and its share of the music industry’s revenue keeps growing. 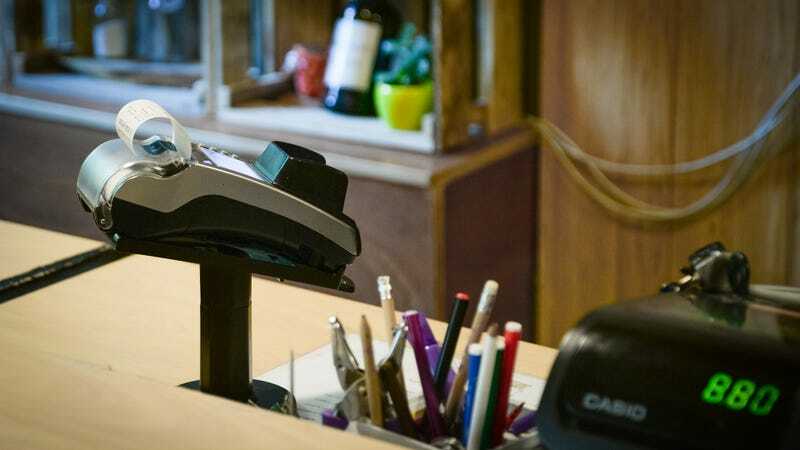 The study, which was conducted by the Recording Industry Association of America, is an auspicious sign for Spotify, which has pioneered the music subscription model over the past few years. China’s Tiangong-1 has met its fiery end. The out-of-control space station plummeted through the Earth’s atmosphere at roughly 7:15pm ET on Sunday evening, as expected. Most of Tiangong-1 was destroyed during re-entry, however parts crash-landed somewhere over the South Pacific Ocean. Speaking to Reuters, astrophysicist Brad Tuckers estimated that 10 percent, or 700 to 800KG may have made it to the Earth’s surface. "Most likely the debris is in the ocean, and even if people stumbled over it, it would just look like rubbish and be spread over a huge area," he said. Tiangong-1’s demise was confirmed by the China Manned Space Engineering Office and separately by US Strategic Command, with help from "counterparts in Australia, Canada, France, Germany, Italy, Japan, South Korea and the United Kingdom." The event was largely publicised due to misplaced fear that the craft could land on a heavily populated city or town. In truth, this was always highly unlikely — the Earth is mostly ocean, and humanity occupies a relatively small part of the green bits. 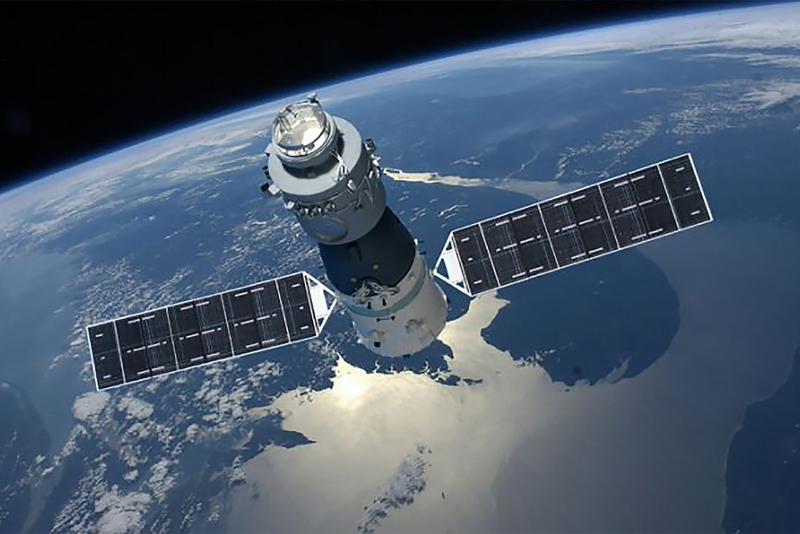 Still, a human collision was possible, and Tiangong-1’s large size (it was 10.4 metres long and weighed 18,740 pounds) was an understandable concern. The space craft, known as "Heavenly Palace 1," was launched in 2011 as a testbed for orbiting and docking experiments. Two astronaut crews visited the station using Shenzhou capsules in 2012 and 2013; the first mission included Liu Yang, the first Chinese woman in space. China’s long-term plan is to have a larger, modular station in orbit by 2023, and originally planned to decommission Tiangong-1 by 2013. That didn’t happen, however — possibly because Tiangong-2 wasn’t ready — and in 2016, the country’s space agency told the UN that it had lost control of the vessel.